Italy - IOM reports this morning that deaths of all migrants and refugees attempting to reach Europe by sea in 2015 now total 2,373. The death toll recorded on this same date in 2014 was 2,081. Over the last 365 days, IOM has recorded 3,573 migrants who died attempting to reach Italy, Greece and Spain by sea – an average of nearly ten deaths per day. Today’s figures include the most recent loss - a 14 year old Somali boy - whose remains are being transported to Italy this morning. The figures also include seven migrant deaths reported in the last five days in Greek waters. A 30 year-old Syrian man was reported drowned off Greece on August 21. Yesterday IOM monitors in Greece also reported that the bodies of two migrants from Iraq had been recovered. The two victims - both men, aged 30 and 23 - reportedly were found carrying EUR 4,000 in cash - money that the Hellenic Coast Guard is now trying to return to their families. Four more people were reported lost at sea in the area - three of them believed to be Iraqi men in their late teens, and the fourth a Turkish national, who may have been working as a smuggler. An IOM official in Athens noted that the Hellenic Coast Guard has announced that now that the weather is now likely to deteriorate. This will likely increase in the number of deaths in the Aegean through the end of the year. The 2015 total to date - 2,373 on all sea routes to Europe - is barely 1,000 short of 2014’s final death toll of 3,281. Last year, from late August through the end of December, over 1200 migrants died at sea. IOM is concerned that as summer turns to autumn and then winter, additional deaths at sea could well surpass 2,000 through the final third of this year. About 4,400 migrants were rescued in the Channel of Sicily on Saturday and Sunday, in one of the busiest weekends for search and rescue operations in the Mediterranean since the beginning of 2015. The many ships involved in the Mediterranean picked up – sometimes very close to the Libyan coast - thousands of migrants in unseaworthy rubber dinghies and fishing boats. Many of these boats were in distress. In one case, rescuers saved about 100 migrants who were on a dinghy which was half-deflated. “The life-saving mechanism operating in the Mediterranean managed to rescue over 4,000 migrants, saving all of them. This has been a remarkable achievement, and IOM commends the work carried out by the Italian Coast Guard and Navy, by all the international ships operating under the Frontex/Triton mandate and by all the other ships that are committed in saving migrants’ lives at sea,” said Federico Soda, Director of the IOM Coordinating Office for the Mediterranean in Rome. Migrants rescued at sea have been brought to the Italian ports of Messina, Palermo, Trapani and Lampedusa (Sicily), Vibo Valentia (Calabria), Cagliari and Taranto (Apulia.) Among the migrants there were many Eritreans, Somalis, Sudanese, Sub-Saharan Africans, Syrians, Bangladeshis and others. 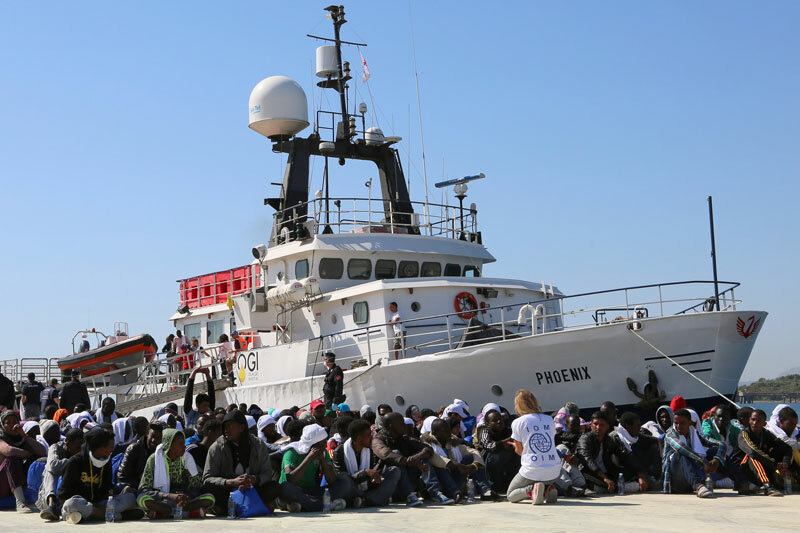 “Migration flows to Italy are mixed: there are asylum seekers, as well as vulnerable migrants - including women victims of trafficking and unaccompanied minors - and also a large number of migrants looking for work. Irrespective of nationality, all these people must be individually screened to determine their status,” says Soda.